Boeng 737 is widely used by Russian airlines. RBTH presents a selection of views from leading Russian media on international events, featuring reports on problems facing aviation manufacturer Boeing in Russia, the Russian representative to NATO’s thoughts regarding the country’s strained relationship with the organization and how little was learned from decoding the flight recorders on the crashed A321 passenger plane. The RBC business newspaper reports that on November 5 the International Aviation Committee (IAC; also sometimes known by its Russian acronym MAK – RBTH) informed the Russian Federal Air Transport Agency (Rosaviation) of its decision to stop certifying Boeing 737s with Classic and NG modifications. A letter addressed to Rosaviation Director Alexander Neradko and Associate Administrator of the U.S. Federal Aviation Administration (FAA) Margaret Gilligan says that on August 26, 2015 Rosaviation wrote to the IAC in relation to the necessity of guaranteeing a fail-safe mechanism for the 737s' elevator systems. IAC says that the FAA, after a year of correspondence, did not send any reply specifying that Boeing planes were in a condition that "guarantees their safe use." The last accident involving a 737 in Russia occurred on November 17, 2013 when a Boeing 737-500 flying from Moscow crashed upon landing in Kazan. 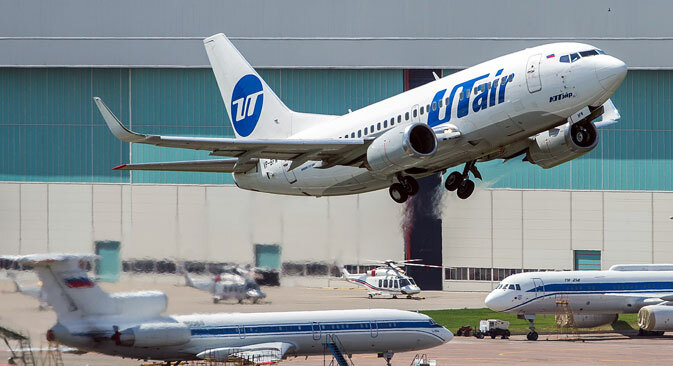 "After the accident the IAC wrote to the FAA pointing out the (issue of the) 737 model's elevator,” says a source close the Russian government. “Neither the American regulator nor Boeing reacted to the results of the accident's investigation." Representatives of Boeing Russia CIS were surprised by IAC's announcement. "I cannot say that it is fake because there isn't enough information,” said Boeing Russia CIS Public Relations Director Elena Alexandrova. “But it sounds preposterous and it is still unclear what it's all about,"
"If the document is sent to the Russian aviation authorities and they revoke the Boeing 737 air operator certificate, half of Russia's airlines will stop flying," notes a source close to Aeroflot. Rosaviation held a meeting with airline and IAC representatives about the use of Boeing 737s on November 6. After the meeting Nataliya Filyova, co-owner of S7 airlines, reported that the IAC had recalled its letter on suspending the Boeing 737 type certificate. "The IAC has recalled its letter, it doesn’t mean anything," Filyova said. She added that the IAC has drawn up a new letter but has refrained from disclosing its contents. Russian Permanent Representative to NATO: "NATO officials question alliance's decision to refuse cooperating with Russia"
Official Russian Representative to NATO Alexander Grushko talked to the Vzglyad newspaper about the new military situation along Russia’s borders. Grushko said that until the mid-2000s no combat forces in the Baltic States had been deployed. "NATO started by deploying four planes in Lithuania as part of a program of patrolling the three Baltic countries' air space and today they have deployed heavy technology in forward-operating bases,” Grushko says. “That is why we need to consider not only what has been realized up to today, but the trend itself. And the trend is obviously negative - we are seeing a strong drive towards increasing the military presence." Speaking about the possibility of renewing cooperation with NATO, Grushko underlined that Russia still has not received any "clear signals that NATO is ready to review the decision it made on April 1 last year to freeze all cooperation projects." Nevertheless, he said that, "In the course of many of my unofficial contacts, there are those in NATO who question the alliance's decision to refuse cooperating with Russia on a whole series of issues, issues that represent a common interest,” Grushko says. “This includes the situation in Afghanistan, which is deteriorating in all spheres in terms of safety, the fight against drug trafficking and the social-economic situation is definitely not improving. In addition, there are new factors such as the penetration of the Islamic State in Afghanistan and of extremists moving closer to northern borders, to the CIS countries." The results of decoding the flight data recorder from the Kogalymavia Airbus A321 passenger plane, which crashed in the Sinai Peninsula on October 31 killing all 224 people on board, have not helped establish the cause of the air accident, the Kommersant business daily reported. According to the newspaper's sources, the decoding results did little to help the investigation of this crash. "The recorder has shown that for the entire duration of the flight, which continued for a little more than 20 minutes, all systems of the A321 were operating properly,” the newspaper said. “After takeoff, the airplane, which was on autopilot, almost reached the altitude needed to enter its assigned flight level. However, afterwards, something happened, after which the recording of absolutely all parameters of the airplane systems' work abruptly stopped." One of Kommersant’s sources compared this recording to a cardiogram that could only register a person's sudden death caused by cardiac failure, whereas only additional tests could help establish the actual reasons for what happened. The newspaper's sources believe that the events could have been triggered by the explosive decompression of the airplane's cabin, causing the plane's fuselage to separate from its tail, which accommodated the emergency flight data recorder. This separation was accompanied by a rupture of all cables that linked the black box with the information sensors, the newspaper said. However, the operational recorder, which collects information on a daily basis in order to monitor the functioning of all airplane systems and the crew's actions, may have continued to record the parameters of the already uncontrollable flight. But this operational recorder was located in the cockpit, was not protected by any specialized armored and fireproof cover and apparently crashed on impact with the ground, Kommersant said. RBTH best stories every Wednesday. Just try.